I presented this paper at the Oxford Symposium of Food and Cookery, July 2011 and it was subsequently published in the ‘Proceedings of the Oxford Symposium of Food and Cookery, 2011 “Celebration”. The cover photo comes from my collection of postcards. 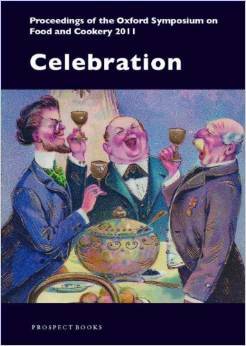 While collecting old postcards depicting punch bowls and punch drinking, I have been fascinated by the number of greetings cards dating from the late nineteenth century to the 1940s, for Christmas and New Year, in which punch played a central role. Looking further into the role played by punch at these celebrations has highlighted some interesting differences over time and country, resulting in punches with little similarity to each other, but which share certain defining features – a common heritage, conviviality around a punch bowl containing a blend of varying ingredients, and a festive symbolism associated with certain recipes and customs. In modern times ‘champagne’ is often synonymous with celebration, but during the eighteenth and nineteenth centuries punch was often the celebratory drink of choice. To be ‘drunk with great animation, not in champagne, but in rum punch’ was not unusual. An advantage of punch has always been that it can be made in large quantities to serve a crowd with ease. Before looking further into these festive punches, some definition and history of punch is required. The first recorded mention is in a letter to an English East India merchant, Thomas Colley, in eastern India in 1632 from another merchant, Robert Adams, encouraging him to ‘drincke punch by no allowance…’ Over the next century, punch spread to the Caribbean, the eastern seaboard of America, and Europe, was widely written about and mutated into subtly different concoctions, reflecting the availability of ingredients, cost and season. One theory for the origin of ‘punch’ is that it means ‘five’, deriving from the Hindi ‘panch’, due to the five ingredients (water, alcohol, fruit juice, sugar and spice) supposedly included in punch. However, one of the earliest descriptions, from 1638, describes punch as having only four ingredients: eau-de-vie, rose water, lemons and sugar. The name may also be a corruption of the name for a drinks barrel on board ship – a puncheon. The earliest published English recipe, based on wine and including no water, comes from Hannah Woolley’s “The Queene-like Closet” (1670): ‘Take one Quart of Claret Wine, half a pint of Brandy, and a little Nutmeg grated, a little sugar, and the juice of a Limon, and so drink it.’ Toast, raisins, cinnamon, nuts, ambergrease (a perfumed secretion of sperm whales, regarded as an aphrodisiac) and ‘other ingredients’ could also be added. . In Britain, the increase in alcohol-related problems was noticed during the second half of the seventeenth century, as the population moved away from drinking weak beer, cider and wine, to spirits such as brandy, rum and eau-de-vie, drunk straight or in punch, cordials and ‘waters’. The arrival of cheap gin in the early eighteenth century exacerbated the problem. In an attempt to reduce alcoholism, taxes and licensing laws were introduced, and the amount of water, tea or milk added to punch began to increase, partly to avoid the higher costs of spirits, but also due to a change in fashion for lighter punches. By the first decades of the eighteenth century, punch developed a consistent style base on four main ingredients: Acid (lemon, lime or orange juice); Sweet (sugar); Strong (alcohol (brandy, rum, arrack (distilled palm wine) and sometimes wine); Weak (water, tea, milk or eggs). Recipes frequently followed a set proportion between these elements: one (measure) of sour, two of sweet, three of strong, four of weak which resulted in the ‘ideal’ punch of a balance between the four ingredients. By the nineteenth century, punch recipes were changing again. The fixed proportions were no longer always followed; many different fruits, liqueurs, wines, and even beer were added and generally punches became less acidic and more sweet and rich. At the same time, the nature of Christmas and New Year celebrations changed, becoming more dramatic and ritualised. The same punch every year became an essential part of the festivity. Punch bowls, sometimes with matching cups, decorated appropriately for Christmas (Christmas scenes, evergreens and Father Christmas) or New Year (words and music of ‘Auld Lang Syne’) set the scene. The Convivial custom of drinking toasts is one which is practised whenever any particular occasion brings a party together which is interested in the same subject: Christmas being the season par excellence. The punch has half a lemon, sherry, brandy, rum and boiling water, with extra water and sugar for younger drinkers. Juleglögg, traditionally regarded as Denmark’s Christmas punch, includes red wine, brandy and port and is seasoned with orange peel, cardamom, cloves and cinnamon, with raisins and almonds added. Just before serving, ‘a fine wire mesh [is placed] over the kettle’ to hold the sugar cone. brandy is poured over the sugar and set alight. Once the sugar has all melted, the Juleglögg is served hot. In Germany this punch is known as Feuerzangenbowle, (‘fire-tong punch’). Part of the theatre is that while the sugar cone is burning, the lights are dimmed and the flames are a focus of attention. For some, the ceremony is more important than the drink; celebrating the gathering of friends and conveying a notion of Gemütlichkeit (warm, cosy geniality). The camaraderie around the bowl of flaming punch was celebrated in the film ‘Feuerzangenbowle’ (1944). Christmas punch in the Americas developed along different lines. On Christmas Day 1795, Theophilus Bradbury wrote to his daughter Harriet about his Christmas dinner with George Washington. They ate ‘roast beef, veal, turkeys, ducks, fowls, hams &c.; puddings, jellies, oranges, apples, nuts, almonds, figs, raisins, and a variety of wines and punch.’ The type of punch is not specified, but Washington did write down his recipe for eggnog, which included rye whiskey, Jamaican rum, sherry, eggs, sugar, cream and milk. The egg whites were beaten up and folded in. In 1815 an English observer noted ‘a liquor with which the Americans used to treat their friends on Christmas Day, and which is called egg-nog.’ In ‘the South it is almost indispensible at Christmas time, and at the North it is a favourite at all seasons.’ Eggnog has more eggs than an egg punch, making it more custard-like and was regarded by many as a healthy and innocuous drink for all the family. The Temperance movement struggled to convince people that it was indeed alcoholic. A more alcoholic version with extra brandy was called ‘Tom and Jerry’ and was said to have been inspired by Pierce Egan in the 1820s in his journal ‘Life in London’ . Egg punches (although not necessarily for Christmas) are also found in England and in the Netherlands and Germany (Eier Punsch). Dutch bottled Advocaat is part of this same tradition of festive eggnog. To celebrate mid-winter with a punch made from fresh milk or eggs was a major celebration. Milk and egg punches were normally reserved for the summer as milk and eggs were less readily available in winter and expensive. To mark the start of the season, the first Sunday in May is called Milk-a-Punch Sunday in the Channel Islands. Condensed milk in tins was available from the late 1850s, pasteurized milk and evaporated milk in tins from the 1890s, followed by bottled milk in the early 1900s. ‘The Practical Housewife’ (1860) has a ‘Milk Punch for Christmas Day’ made with lemons, rum and milk. As with a posset, where the milk was curdled by ale or wine, the milk was curdled by adding lemon juice; the strained punch, made from the whey, is mild and delicate. ‘four cents per dozen; and this morning, I took them out to make egg nog for the ladies (Lord bless them; for they must all have egg nog on Christmas, in Kentucky), when I found them as fresh as the day when they were put up. … My neighbors wish to know where I get eggs at four cents per dozen, while they are paying this morning forty cents a dozen – or no egg nog. A classic eggnog recipe from Croly’s (1866) book included egg yolks beaten up with sugar and nutmeg, rum and brandy or Madeira, whisked egg whites and creamy milk, served uncooked. Before breakfast, at Christmas time, everyone takes a glass of egg-nog and a slice of cake. … As Christmas was kept during four days egg-nog was drank regularly every morning. That Dickens was associated with the eggnog recipe is interesting, as his recipe for Christmas punch, as we have seen, was quite different. In Texas, December 1872, it was noted that ‘Most of the Austin saloons will ‘make merry’ in a genteel way on Christmas morning, and will treat friends and patrons to excellent egg-nog.’ A list of the saloons, and times when free eggnog would be served, was given. Punch evolved to suit taste and the ingredients available. During the American Civil War (1861-65), Federal prisoners of war made their Christmas eggnog: ‘And such egg-nog! – made without milk’. It was made with beaten eggs, whiskey or brandy, nutmeg and sugar, but with water replacing the milk, resulting in ‘a delicious egg-nog, without its usual deleterious qualities,’ though what he means, by the bad effects of an eggnog made with milk, is hard to say. Similar traditions are found in the Caribbean. In a 1788 Jamaican Christmas, the slaves visited ‘the white people during the festivity, and are treated with punch.’ After emancipation, American traditions were seen as ‘superior’, civilised and ‘Christian’, and drinking egg and milk punch at Christmas was adopted. ‘It was usual to rise early on Xmas morning and mix [a] huge bowl of egg punch which the elders enjoyed.’ Recipes vary from island to island and, due to the lack of fresh milk, used tinned milk, and are generally cooked. In Dominica, Ponche de Ron, is sweet and unctuous, made with evaporated milk, condensed milk, rum and egg yolks cooked together and served chilled. In Trinidad Punch de Crème is made by whisking eggs flavoured with lime zest, then cooked slowly with condensed milk and evaporated milk until the mixture thickens, then seasoned with nutmeg, cinnamon, ground cloves and vanilla. When cool, Angostura bitters and rum are added before bottling; it is served cold. Its part in Christmas tradition is immortalised in Lord Kitchener’s parang (calypso) ‘Drink Ah Rum and a Punch de Crème’. On the Hispanic islands and South America, recipes for Christmas punch also included eggs – either following the north-American tradition, or a Spanish tradition of egg yolk based punch. In Venezuela, the ponche Navideno (Christmas punch), is made with evaporated milk, eggs, rum and the unusual addition of anise. Don Eliodoro’s bottled ponche first appeared in 1900 and continues to be successful; the company’s motto is ‘Navidad es compartir!’ (Christmas is for sharing). In a punch bowl, place several slices pineapple, lemons, oranges, Benedictine to taste, drops bitters, sugar, stir – add a little soda, ice, add Cognac, Whisky or Rum. Allow to stand a moment then add the Champagne and serve. In Mexico recipes using local and seasonal ingredients developed within families, although they were not published until the 1980s. Both of the following punches are served hot. In Mexico Ponche Navideno, is served at midnight on Christmas Eve and throughout the season. Its three basic ingredients are tejocote (Crataegus pubescens stipulacea, similar to a crab apple, which ripens in December) – added whole or quartered, guava and sugar cane. Tamarind, hibiscus flowers and piloncillo (dark brown sugar cone) are also traditional. Almost any available fruit can be added and stewed until soft. Tequila or rum can be added when serving, making it a Ponche con Piquete (punch with a sting). Guatemalan Ponche Navideno contains dried fruit such as pineapple, papaya, mango and peaches, but not guavas or tejocote . It can also contain cinnamon, cloves, black peppercorns, mamey (Mammea Americana – South American apricot) and coconut. Sometimes the same punch is drunk throughout the winter season, with variations according to the occasion. A Louisiana Creole eggnog in 1900 was made with boiling milk and whisked egg whites, and ‘served cold by the Creoles at New Year’s receptions. At the famous Christmas and New Year Reveillons it is served hot’. We greeted the entrance of the New Year in the good old English fashion. A bowl of punch was prepared, and whilst the clock, striking the hour of midnight, tolled the knell of the expiring year, we drank to the health of our dear distant friends, with fondest wishes for their welfare and happiness. A British army officer fighting in South Africa celebrated New Year’s Eve 1899-1900 with ‘…a fine bowl of punch, with slices of pine-apple in it, which we shared with our men on watch, wishing them all a happy New Year.’ In 1860s Denmark, a milk punch was traditional. ‘it would be advisable to fetch some milk punch to drink the old year out.’ Many New Year punches are variations of the fruity Christmas punch. A modern Danish recipe for ‘New Year’s Eve Punch’ includes warm spiced cider and tea. The 31st December is St Sylvester’s Day, so Central European punches are often called Sylvester Punch. Polish Poncz Sylwestrowy is made with white wine, sugar, arrack, vodka or rum, lemons and oranges. German Silvesterpunsch is made with mulled wine, lemon juice, sugar and spices and rum. Silvesterpunsch was dramatized in the East German musical comedy “Silvesterpunsch” (1960) and in the television series “Ein Herz und eine Seele” episode ‘Silvesterpunsch’ (2008). Hungarian Sylvester Punch or Krampampuli is served hot and contains chopped dried figs, candied ginger and fruit peel infused in brandy, red wine, orange and lemon juice, tea and some vinegar. Austrian Sylvester Punch is a mulled mixture of red wine, tea, cinnamon and cloves, served with jam doughnuts. Austria invaded Italy during the 1850s and 1860s and during this time may well have introduced the tradition of drinking Sylvester Punch at New Year’s Eve. Lady Isabel Burton described the celebrations for New Year in Genoa when ‘as the clock struck twelve on St. Sylvester’s night, 1857, as we all shook hands and drank each other’s health in a glass of punch at the Café de la Concorde.’ Helen Barolini describes family celebrations in Vicenza in north-east Italy, greeting the New Year and chasing away the demons which brought bad luck. 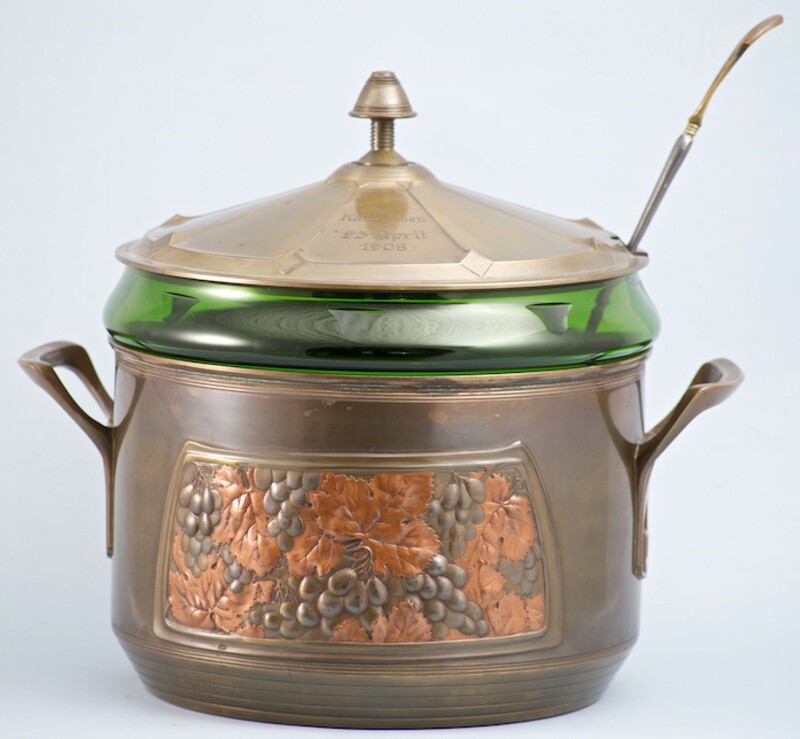 Family heirlooms were brought out, including the ‘silver punch bowl … set out on the old credenza’ and a traditional dish of lentils is accompanied by ‘the Saint Sylvester punch bowl for laughter and merriment’. Barolini’s version includes tea, rum, brandy, lemons and an Italian addition of sparkling Lambrusco wine. Punch is seen in all its glory on this day and each household strives to have the best of this article. There are regular punch-makers in the city, who reap harvest at this time. Their services are engaged long beforehand, and they are kept busy all the morning going from house to house, to make this beverage which is nowhere so palatable as in this city. The party centrepiece of Christmas fare for all fourteen families of the islet, or 230 people in total, was three 10-gallon pots of Hawaiian punch, made from packets of crystals mixed with rainwater and additional sugar… Hawaiian punch was Christmas dinner for the assembled community. The concoction may not have answered any strict definition of punch, but the important point, as with all the celebrants above, is that in the eye of the drinkers, they are gathered around a bowl of punch, sharing their festivity. Celebratory Christmas and New Year punches had different ingredients and methods of making. They included expensive or rare ingredients, such as champagne or pineapple; unseasonal ingredients such as milk or eggs; or seasonal fruit such as tejocote and cranberries to emphasise the unique time of year. They could be flamed, emphasising the mid-winter element of the festivity. One feature that remains constant, is the atmosphere created when people gather around a punch bowl, sharing a communal drink which has developed a symbolism associated with the festivity.